THE ULTIMATE RACING EXPERIENCE. BUILT FOR 4K. The best-selling racing franchise on any platform this generation. Experience the thrill of motorsport at the limit with the most comprehensive, beautiful and authentic racing game ever made. Enjoy gorgeous graphics at 60fps and true 4K resolution in HDR. Collect and race more than 700 cars. Challenge yourself across 30 famous destinations and 200 ribbons, where race conditions can change every lap and every race. PRE-LOAD: Download the game now. Game will be playable on 10/2/17 at 9pm Pacific Time. 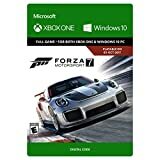 This game includes: Forza Motorsport 7 digital code for Xbox One and Window 10 PC. Everyone can compete: featuring the Forza Racing Championship esports league, enhanced spectating modes, and amazing split-screen play. Xbox One and Windows 10 PC exclusive. Supports Xbox Play Anywhere: yours to play on both Xbox One and Windows 10 PC at no additional cost.